. p r a i s e .
I enjoyed viewing your web site. The rose is my favorite flower. You have some beautiful photos. Brenda- The site is beautiful and so are you! I enjoyed everything. Best of luck in this venture! Although I am a "rose" person, I loved the dahlias! Think about trying some iris. I also liked the double Cajun Sunrise. Enjoy your new endevour, "cousin"! Wow, wow, beautiful site. I hope some day to be able to do this type of work. Thanks for sharing your love of roses and photography. I didn't know you were this kind of artist! This is beautiful. I love the rose that headlines your website. Your pictures are absolutely stunning! Especially loved the dragon fly. You have done it again. Your artistic abilities have no end. What beautiful work. Congratulations, you are the best! Your life has MANY meanings. THAT is a gift to you and to those around you. Each and every endeavor you take on, you illuminate that chosen path, and share the beauty you create with everyone around you. Thank you for including me in your circle, and I look forward to watching your spirit shine through your artwork! Brenda, every picture reflects the beauty of God's creation. You do a great job of making them stay alive. I was tempted to smell the roses. I will return to your site. Well, you just never cease to amaze me - you bring beauty to everything you touch - breathtaking! we must talk about my buying a present for me!! WOW! I had no idea you had such talent. Absolutely beautiful! Thanks for sharing! What an absolutely gorgeous website. Your art and photography are stunning; sublime on so many levels. I think you are blooming, just like a rose but more beautiful. You followed your passion and we are blessed to be able to share it. It's a fabulous website. You have given a new perspective on an already beautiful flower. I Am A First Time Visiter And I Am Very Excited.Thanks! Very cool site! Jack and Bonnie Shultz shared your site with me. Good Luck! Breathtaking, Brenda.....how neat that your favorite thing in the world is so beautiful.....and you have enhanced its beauty even further. Absolutely Gorgeous, the clarity and intense colors in your photography is incredible. I'm so impressed. Congratulations ! What beautiful work! You have a soul that shines with passion and talent. Love to you on your journey!!! Hello. Wonderful work. I love it all. The Yorkie is so sweet! What a talent! Thank you very much for sharing it with us. I find that such work gladdens the heart. I have been looking at all the beauty here and realizing how truly talented you are! You capture the intimate details of nature in a way that brings tears to our eyes! I know Joe's mom, Gloria, looks down and smiles her sweet smile at your love and your passions. We are all so proud of you. Peace, Love, Joy & Hugs, "Aunt Becky & Uncle Frank"
I learned of your site from John Bagnasco on the Garden Compass Radio. He told of his Christmas present. Thank you for this gorgeous awesome site. I am a member of the San Diego Rose Society. This is a beautiful site for Rose lovers and all who love the awsomeness of creation..
Neat site Lady Bren. Beauty abounds here! Wonderful photography. Your ad in the latest Journal of the American Rose Society caught my eye. I am always looking for wearable art. Well, I have just pulled myself out of YOUR life and my head is in a swirl. How lovely for your love of flowers as a young girl to be transformed into this talent, vocation and avocation. It is no longer a mystery to understand the beauty and inner peace you so effortlessly project when I see you at the CCRS meetings. Thank you for sharing a bit of your life with the world. 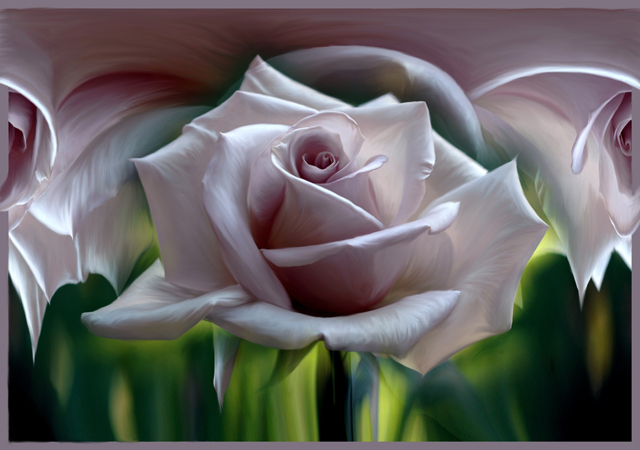 By the way, when I first entered the site, and became entranced with the concentric petals of that first rose, I was channelling Georgia O'Keefe. Absolutely brilliant! The intensity of colour and form is so beautiful - I can feel the cool, silk of each petal. Never stop putting out the positive energy - it heals all. I never knew the artist in you until now. Brenda, the beauty that radiates out from you is the one from within and I consider myself extremely fortunate to have met you and have my roses judged by you (10/05 So. Coast Palos Verdes Rose Show). I would love to drive miles to see your art work in person and hope to see this part of your stunning website develop soon. I just checked out your site. You just bought one of my teddy bears. I'm so thrilled to meet you and see your work! I hope to do business with you again! Lovely, lovely work! You are one of the most amazing artists I've ever come across...so diverse! My husband and I and our daughter who is an up and coming photographer were all just blown away. If you don't mind, I've forwarded your site to all of my contacts in my address book! Awesome site Lady Bren. You are not only a beautiful lady, you also enhance the beauty you behold. Wonderful site! God bless you and yours! As often as I turn to your unique and inspiring web site, I can't understand why I've not signed your guest book before. I must say I have always found it to radiate the love and beauty that is within you. You are so very talented and so very missed. Your beautiful flowers and other pieces of art are true pieces of celebration of God's amazing world for us to celebrate!! Thank you for sharing these beautiful visions with me!! I really enjoyed ALL of it. The pictures of the Yorkie really brought me back. I lost mine this year. That is a beautiful one. You do beautiful work. Love the others also. Thank you for sharing this with all of us. A friend sent this email to me. Bee-eautiful work. I'm so impressed! The teddy bears look very cute and almost alive! You sure have beaucoup talent and are a blessed woman. More success in all your many endeavors you have in your art, photo, jewelry and bear making! Hope you have all the hours in the day you need!! Brenda your art is beautiful...just like YOU!! Hi Bren ! This is your new artist friend from Facebook dropping in to say Hi ! I love your work ! You should put some of it in the Bayou City Art Festival over here in Houston !